The current price of gold, one of Peru’s 2 main exports (the other is copper). Here in the Empire of blood and gold the effects of the run-up in gold prices are decidedly mixed. 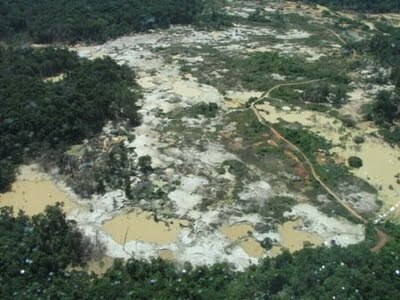 While gold certainly has been good for Peru’s macro-economic numbers, the current gold rush in places such as the pristine jungle of Madre-de-Dios has undeniably had a significant environmental and social impact. On the purely financial aspect, I tend to agree that gold will likely do no better than protect your purchasing power in the long run. Gold has no intrinsic value and I’d say the current run-up is largely due to lack of faith in paper currencies, since central banks are printing them up like Monopoly(tm) money, but you can’t expect artisan miners in Peru or the suits at the TSX to give 2 hoots about that. Here’s to Peru’s Ministerio de Energia y Minas. This entry was tagged gold, mineria, mining, Neil Young, Peru. Bookmark the permalink.